"Emory University Hospital's new addition is an important milestone in patient care on Emory's campus, in metro Atlanta and in Georgia," says Jonathan S. Lewin, MD, president, CEO and chairman of the board for Emory Healthcare. "The topping out ceremony recognizes our success with the progress of this building, while looking toward the future and our mission to serve humanity through integration of education, discovery and clinical care. This kind of innovation is just part of the reason Emory University Hospital has earned U.S. News and World Report’s number one ranking for Georgia and Atlanta five years in a row." 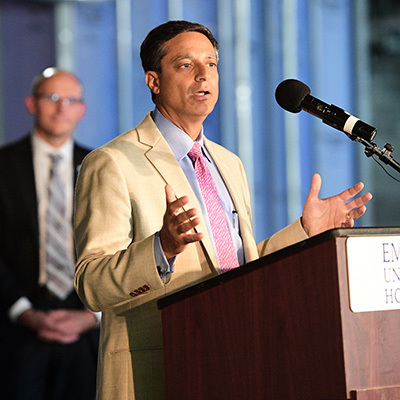 Pictured: Winship's Chief Medical Officer Sagar Lonial, MD addresses gusets at "topping out" ceremony.